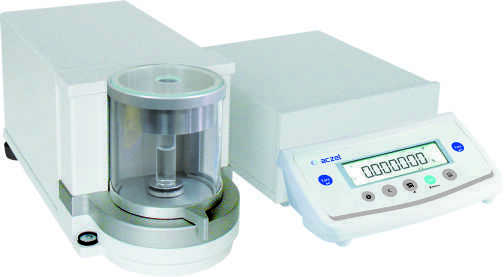 CM-P series of balances has been specially designed to meet high requirements for measuring small masses with readability of d=1μg with inbuilt PSAC system. The weighing chamber has been specially designed for calibration of pipettes. Non-centrically located aperture in the upper part of the chamber makes it easier to insert a pipette. Such a Solution Limits possible air droughts. Pipette calibration conducted with a closed weighing Chamber. Pipette Micro Balances are equipped with graphic display with extended user menu. Aesthetic, cylindrical-shaped weighing chamber made of glass, which minimizes the influence of electrostatic charges on the weighing result. Pipette Microbalance software allows for GLP procedures as standard printout or as freely definable non-standard printout. It is equipped with RS232, output and possibility of connecting additional display as standard.